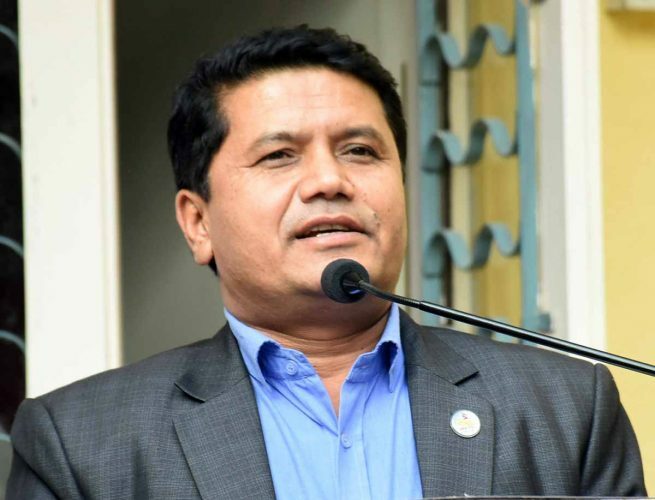 Kathmandu– Minister for Culture, Tourism and Civil Aviation, Rabindra Adhikari, has said the government would move ahead undeterred despite false rumours against it. Speaking today on the certificate distribution ceremony for trainees of a trekking guides training jointly organised by the Nepal Mountain Academy and Trekking Agency Association of Nepal, the Minister said anti-government views were coming from opposing forces with feverish haste as a result of government’s involvement in noble efforts for leading the nation towards good governance. He declared that such stuffs would not affect the government. “The most dreadful psychology existing among us that we feel satisfaction in cursing others and backbiting,” he said. The tourism minister further utilized the moment to share about the government’s plan to creating employment opportunities for 100,000 individuals in tourism sector and conducting tourism-related training for an equal number of people, targeting the Nepal Visit Year. The training package would cover trekking, mountaineering and hotel business. The latest data presents the increase in tourist arrivals at home and this finding had brought happiness and encouragement among the people concerned among the people concerned and upon this ground, we could predict the target to welcome two million tourists by 2020 AD. According to him, the further progress and effectiveness of the national flag carrier Nepal Airlines Corporation (NAC) is vital to promote the tourism industry. He pledged to intervene if wrong tendencies and irregularities existed there. Secretary at the Ministry of Culture, Tourism and Civil Aviation, Krishna Prasad Devkota urged those completing the trekking guides training to bring their learning in practice as they are too responsible for spreading a positive message about the nation to foreign tourists. Department of Tourism director general Danduraj Ghimire and TAAN chair Nawaraj Dahal sought the role of trekking guides to make the Nepal Visit Year successful. A total of 734 individuals were imparted the training. The training aimed to further enhance the capacity of those already associated in this field and creating a base for those wishing to join this, as Academy executive director Romnath Gyawali said.